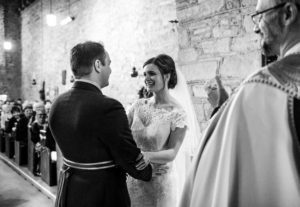 This week we are featuring our bride Lowri who got married to Dave wearing Devoted by Nicola Anne at The Lake Hotel, Llangammarch Wells on 16th December 2017. The photos are by Steve Catcheside, Ketch 22 Photography. Brides of Winchester was the first place I went to with my Mum to look at wedding dresses. We had recently got engaged, and I was really excited to find the dress – however didn’t really have a picture in my head as to what it would be like. 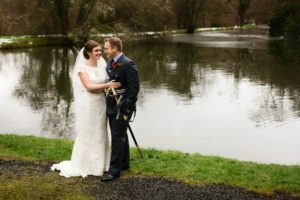 We really enjoyed our appointment at Brides Of Winchester because I was able to try on different styles and really narrow down what looked best. Nicola Anne’s Devoted was a definite favourite; I loved the lace and the vintage feel the dress had. Though I didn’t buy it on the day and did visit other shops, I knew it was the right one because I was always comparing other dresses to this one. After some deliberation we returned and bought it. Coming with just my Mum made it easier to think about what I really liked rather than being influenced by lots of different people. It was a special time for the two of us that I now look back on really fondly. Laura and all at Brides of Winchester were so patient and helpful. 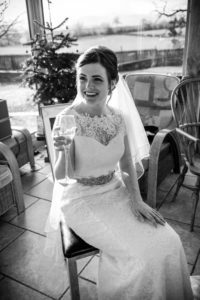 I felt really comfortable in the dress on the day and still felt like ‘me’. The Lake Hotel is beautiful at Christmas with so many trees and traditional decorations. It has a lovely country house, relaxed feel which is just what we wanted. Luke, the manager, really put us at ease, and was so relaxed throughout the process, and things really came together on the day. It is also where my Mum and Stepdad had their wedding reception, so was special from that perspective too. 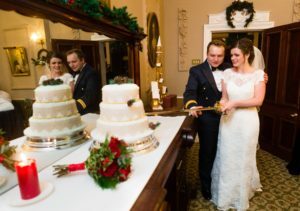 We wanted to avoid staged photos and too much time spent posing for them instead of enjoying ourselves! We liked Steve’s relaxed style and the way he managed to capture natural moments of people relaxing and having fun. Philippa used to do my hair when I was little and also did our hair for my brother’s wedding. I was really pleased with the look she created which went really well with my dress. 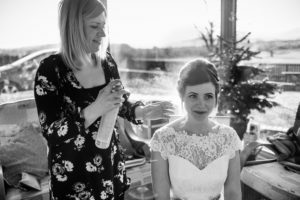 I went to school with Emma who did our make-up, and she often works with Philippa, so that was also an easy choice. It was lovely having people there in the morning that I felt completely at ease with, and we had a nice relaxed morning together. 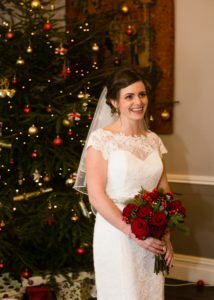 We got married the week before Christmas so went with the Christmas theme – reds and greens in the bouquet, crackers on the tables, etc. It was very straightforward as the church and venue were already decorated for Christmas, so there wasn’t much to add. 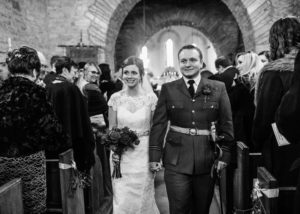 It was a lovely time of year to get married as everyone is in good spirits, and hopefully added to the overall feeling on the day. Deep red roses and lots of greens, which looked romantic as well as fitting in with the Christmas theme. 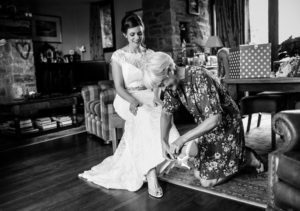 I felt surprisingly relaxed and really enjoyed a relaxed morning getting ready with my family and bridesmaid. Throughout the planning we tried not to get too stressed about the little things, and so on the day I just tried to go with the flow and not worry too much. 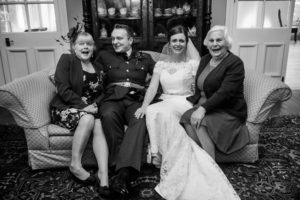 I had anticipated feeling really anxious but on the day I just enjoyed getting married surrounded by the people we care about. 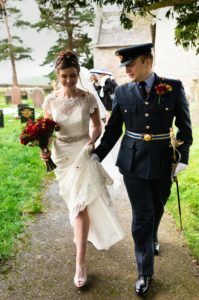 Initially I felt nervous seeing everyone look at me as I walked down the aisle, but also felt unexpectedly calm and just enjoyed the service and getting married to Dave! The readings we chose were lovely and we also really enjoyed the songs the choir sang. It all felt really special and I will never forget it. “Shut up and Dance” by Walk the Moon – we wanted something upbeat, and to avoid anything cheesy – but looking back we do wish we’d practiced a little bit before the day! Too many highlights to choose just one! 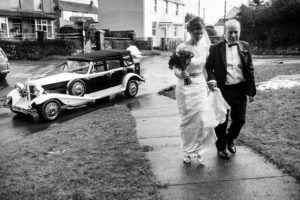 I particularly enjoyed the car journey with Dave from the church to the venue, as it was a chance to catch up just the two of us over a glass of bubbly. Just relax and enjoy it – make the day about the two of you, have as much fun as possible! Thank you so much for sharing Lowri! Why not share your own special day! 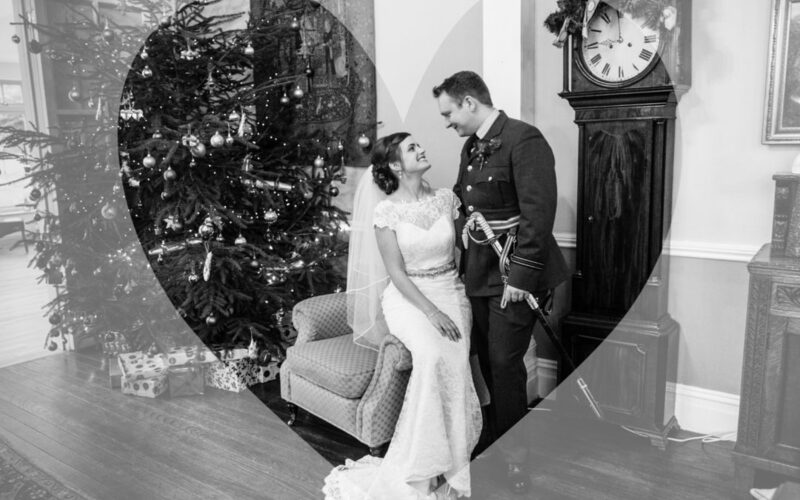 Send your snaps to mydress@bridesofwinchester.co.uk or tag us #bowbride.